Earlier this year, a new web magazine focusing on the genre of costuming, both professionally and just for fun, was launched on-line, and had over 65,000 downloads of its first issue. Called Cos&FX Magazine, this publication was put out by the creative folks who also manage other genre periodicals such as Pyrate's Way, and features interviews with costume/prop builders, photos of costumes from events all over the country, and great resources for those looking to build their own creations. 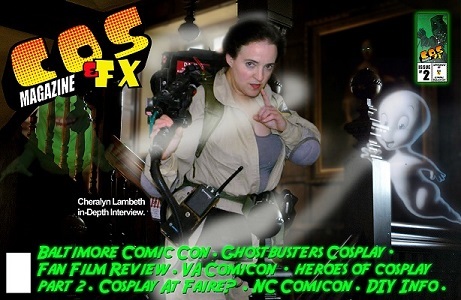 Issue #2 was just released the first week of December; not only am I a featured costumer, but I also have an article published in this issue discussing Ghostbusters costuming in honor of the film's 30th anniversary. You can download the magazine here and read my article on page 34! In addition, I'll be joining the Cox&FX team as a contributing editor starting after Issue #4. I'm looking forward to being on board!